The beautiful but demanding hiking trail from Asphondilitis to Chalara beach, beacons to a world of quaint and smooth rocks close to the sea with romantic bathing places. The starting point for the trip is the farming area of Asphondilitis, located at the footpath between the Monastery of Hozoviotissa and Potamos. Asphondilitis is also accessebly motorized by car or scooter. 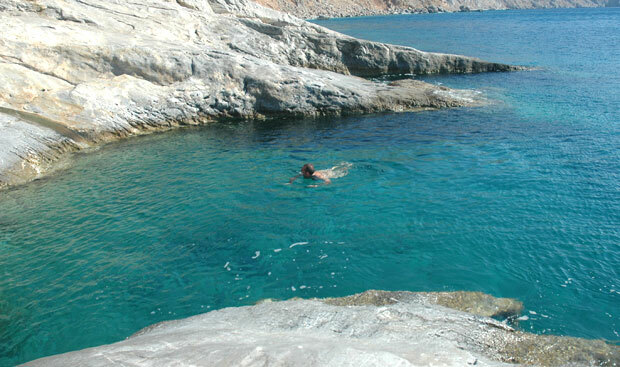 It is a round trip walk with swimming opportunities at the beach of Chalara. Please note: the trail to Chalara absolutely requires walking boots, some hiking experience, good weather conditions and kilter. For the last 600 meters we recommend to use gps based navigation. Follow the smooth ascending mule track from the old village Asphondilitis to Potamos passing the water cisterns for 1,1 km. At this point where the path turns dexterwise to Chalara, it starts dismounting and becomes rougher. On both sides are a few farmhouses and terraces, some of them are still kept in use. After 2 kilometers the trail leads into steper and craggy terrain. Once outpacing the last small farmhouse right-hand, the trail is nearly unmarked. The path leads to a fence with a small gate to walk through. The unmarked track routes left-sided until it crosses the last plateau with the the impressive rocks and deep blue sea of Chalara at it’s bottom. 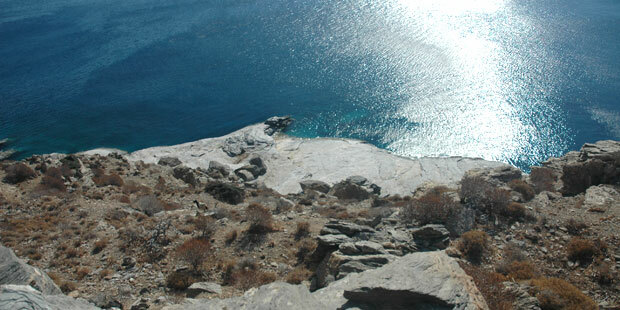 The track for climbing down to the tempting natural veranda of Chalara beach, is close to the ridge on the right. By descending one should steadily check back the trail and memorize the last part of the route, wich is very helpful to find the way back easier. The wide terraces of the picturesque smooth Chalara rocks surrounded by caves and rivulets of sweet water, are perfect for peaceable sunbathing and swimming. Due to it’s exposed position some goats, who seem to love this unique place too, are often the only spa visitors one meets. To see more pictures of the walk, also taken from the seaside, check our Facebook album. Sarah Gray September 29, 2010	Log in to reply. We found it quite difficult to find our way back up from Chalara to begin with. Now we take some coloured tape to tie to the bushes – easy to see from below and to remove on our way back. Wonderful swimming but beware windy days! Paul Delahunt-Rimmer October 3, 2010	Log in to reply.